Tue March 29th, 5:35pm, logged out of system and ready to leave work, and I got a text reminding me to trim my nails short. Ahha, coach is speaking again!! Sat March 5th, I ran 20 miles at Los Gatos Creek Trail in downpour and toward the end I really couldn’t tell what’s all over my face, my running nose or the rain? And I wasn’t the only crazy one :-p When I started this training season, I met a girl at the parking lot of Pleasanton Ridge Trail and I can’t thank her enough for being the best running buddy one can ever dream of. Lucia ran with me on the days & distance that I needed, and she even came all the way to South Bay to run with me so I could get home sooner after our run without getting sick in wet clothing. She would walk with me when I slowed down to take walk break even though she is a much faster runner than I am, and she pushed the cows away and show them who owns the trail. And she treats my goal as serious as hers! 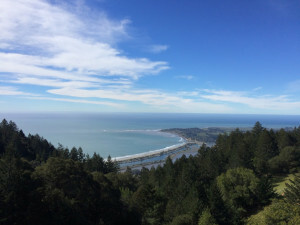 I got the first text about “trim your nails really short tonight, don’t wait till Friday night before the race” from Dennis when he gave me an OK to run the ITR Marin Ultra Challenge 50K. 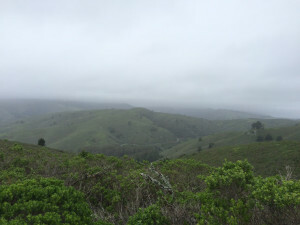 Marin Headlands is a very challenging course that I had learned from two TNF50s already, and this time it was extra tough because of the wind, mud and storm…etc. There were moments that I got pushing down so hard while climbing up the big hills, literally one step forward and two steps back. Completing this MUC50K gave me great sense of confidence and at the same time knowing that I have completed my training and now it’s time to taper and wait for race day to come. In the past I have followed training programs that I found from the internet, and had tried online coaching once but found the cookie cutter coaching didn’t work for me. I am not wired to follow very engineered training plan. Having a coach is new to me, and Dennis’ hand in hand mentoring and coaching is just perfect for my first 50 miler. I think baby-sitting coach makes first ultra distance less intimidating! Dennis has taught me so many things about running ultra in this 3 months, and our training covers footing, core strength exercise, nutrition & hydration, drop-bag, sleep..etc, and he would tell me “look up, see how beautiful it is” when my head was down and only focusing on the rocks ahead of me. My coach not only shows me how to run the distance, but also why we are doing it — for the beauty and love of trails. After signing up the AR50, I have asked my best friends to be my pacers and crews, and that’s totally an emotion-based decision; my heart wants to have them with me when I run my first 50 miler (and probably the last one and only one). However, after going through this 3 months training I’ve learned that it would take more than what I think to fulfill this dream of becoming an ultra runner. Training is the first part, then on the race day there is clear head, sound mind, mental strength, logistics…etc; I know this is not WS100 we are talking about, but to me it will require a village to help me reach and cross that finish line. I will be tired, weak and in pain, and I will not be able to think; so many things can happen after mile 30 and those are the unknown to me. At previous races, I had stopped at mile 24 at SFM and whined “this is stupid, I don’t want to run anymore” when seeing Kiyoko and Vinh waiting and cheering at the last two miles. Or when Michael told me not to slide down the rock at Antelope Canyon but I refused to listen. And I argued with him on varies running issues stubbornly. Why and why? I don’t know, but perhaps because they are my best friends and I know I could get away with it?! I was acting like a rotten and spoiled kid. Definitely not at AR50, right?! So when Coach Dennis checking on my health situation after my appointment with my oncologist and reminding me not being out drinking at night, he offered to pace me at AR50 and I took that offer right away. 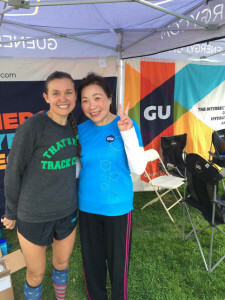 My coach will be the best pacer on race day because that’s what I have been doing for the last three months — listening and following instruction and just run, period. Still, I had doubt!! 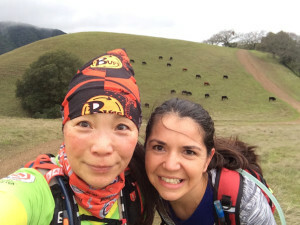 So I shared my shameful experience of wasting so much time at Antelope Canyon 55K with Kiyoko, and surprisingly she told me it’s normal and I have nothing to be ashamed of because sometimes she wanted to quit during her races also. “Without the dark moments, this will be no fun” she said. How come no one told me this before I signed up? I have no doubt in my mind that you will accomplish this goal, one that many of us only dream of. You are an inspiration to all around you. When the adrenaline wears off, your feet and body ache (because they will) and your food no longer fuels, just remember. Angels will carry you. They did once, a scary time not too long ago. They will again. I will be with you in spirit. You are my answered prayer remember? I also tried ultramarathon, and like you I also experienced a hell even when I was just training. But finishing the track even without winning a place is one of my best experiences ever.